I haven’t been blogging for the last months as there are so many new developments in my life. First of all: I am pregnant! And totally excited about it! So we have been trying to get ready for the baby, by searching for lots of baby items second-hand, getting a load of stuff from the former freecycle recycling group “freegle” and my partner’s work colleague even handed down a cot bed to us, too, which was fantastic. There seems to be quite a bit of discussions and disagreement amongst mothers and mums-to-be about whether its better to get baby items second-hand or new; my mum is a fan of used items, especially clothes as she fears residues of pesticides and chemicals, whereas other mums don’t like any potential transfer of bacteria or germs. There might also be an issue of pride here, as some prams seem to hold a status symbol reputation, like cars, too! Especially MacLaren! So the last months and the following ones are going to be taken up with such exciting topics like reflecting about nappy types, breast-feeding’s potential pitfalls and how to keep the bump in check as well as hunting for further baby and maternity accessories. 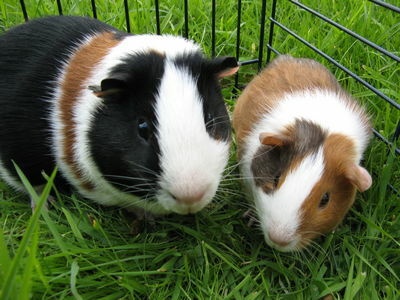 Second of all: My guinea pig Guinea Lee died start of March because of a lung infection. Now Minilli is all alone and I have to find either a good new home for her or a new partner. Guinea Lee was such a cuddly, charming, curious and happy guinea pig, very attached to humans and food, and he is sadly missed. Thirdly I have got friends visiting me in Edinburgh at the moment, it is quite fun to be a visitor in your local city although the recommendations of the tourist guide are sometimes not quite understandable. In Dumont’s Compact little travel guide a highlight of Edinburgh is the Traverse Theatre, Stockbridge and Dean Village and a pub called “The Dome” as well as the National Gallery and the Modern Gallery. I would have rather added Rosslyn Chapel, the Forest Cafe and South Queensferry with the Forth Rail Bridge and a trip to Incholm Island with the abbey and the small fish restaurant as a highlight. Yesterday we went to “The Real” Mary Kings Close, a five star tourist attraction, and were quite disappointed because of the lack of original features in the underground vaults. Most of these seemed to be painted white and plastered with added wooden flooring. Though the costumed tourist guide was quite entertaining, everything was conveyed in the format of little tales and stories, many of whom I had heard before on other tours. Its a good underground tour for children and the average American tourist as the main purpose of the attraction is to entertainingly bring alive medieval times, but historians and intellectuals will be a little bit disappointed. The remainders of the Close is only about 20m or so long and dimly light and you just have a quick walk through of about 5-10min at the end of the 90min tour. We had the best fish’n’chips I ever had in the Doric Tavern, unfortunately we did not frequent the bar menu area as I got a bit confused with the rooms, but we sat down in the restaurant bit, which was much more elegant, had a bit more of an expensive menu and lacked the pub charm my friends were so looking for. Never happened to me before that I was dragging guests into a too elegant establishment! On Sunday we had a look at the beach and a walk along the sea, where we found thousands of starfish washed up dead on the beach. It was quite shocking! My friendly guests invited us to a meal and we chose the Indian vegetarian restaurant Kalpna. It was brilliant as ever and even the meat-eaters were delighted. I loved being able to share the dishes and have so many different tastes, and the dishes were also all quite unusual compared to the typical Indian restaurant. Afterwards we had quite a big discussion about the added service charge of 10% to the bill – how to deal best with it. If an additional tip for the waiter would be appropriate or not, if so how much, if the service charge is enforceable and if it actually goes to the waiter or the staff or just directly to the restaurant owner. Congrats on the soon to be new one! It’s always fun to show someone around your own city, highlighting what you find interesting. I’ve looked at many tour books for East Los Angeles (where I’m from) and they usually just say to stay away! Ha ha!